Sandra Peterson is to leave her role as chair and CEO of Bayer CropScience to join Johnson & Johnson (J&J) as its group worldwide chair. Joining J&J on December 1, 2012, Peterson will have responsibility for J&J's IT and global supply chain, as well as its troubled consumer division, which has been beset by recalls and quality control problems these past two years. The appointment is the first major executive change at J&J since Alex Gorsky became CEO in April, 2012, and he gave his thoughts on what Peterson could bring to such a high profile role. “Sandi Peterson is an experienced global leader known for her strategic thinking and proven track record in growing businesses,” he said. 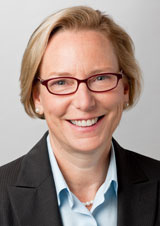 Peterson has held her current role at Bayer since 2010, having previously served as president and CEO of Bayer Medical Care and president of Bayer HealthCare AG's Diabetes Care Division. Prior to joining Bayer in 2005, Peterson spent five years in leadership roles at Medco Health Solutions following a series of positions at Nabisco, Whirlpool Corporation and McKinsey & Company. “With her experience and commitment, Sandi has made significant contributions to the strong business performance of Bayer CropScience in the past two years,” said Dr Marijn Dekkers, CEO of Bayer.